Orders received before 2pm, Monday to Friday will be sent out the same day. 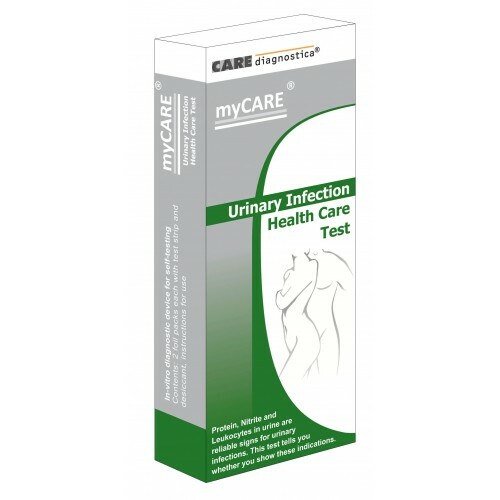 This urine infection test kit is a simple and reliable way to find out in seconds if your symptoms could mean you have a urine infection (UTI) such as cystitis which is generally caused by bacteria. Men, women and children can contract urinary tract infections but they are more common in women. Urinary infections are also more common in older men when an enlarged prostate gland obstructs the urine flow. You need to use an early morning urine sample, collected in a small container. Immerse the test strips supplied in the sample of urine and read the result after waiting for 60 seconds. By testing for three different things at the same time each test strip will give you a more reliable result than single tests alone. Why is an early diagnosis important? The early stages of infection can be without obvious symptoms, depending on whether the infection is in the upper (ureters, kidneys) or lower (urethra, bladder) urinary tract. Early diagnosis prevents the proliferation of bacteria and the development of pyelitis (inflammation of the renal pelvis), which causes severe pain and fever. A positive result for any of these substances is shown by a change on one or more of the three coloured pads per strip indicates that you could have a urine infection and you should speak with your doctor as soon as possible as you may need antibiotic treatment. Please note that this pack has been developed by doctors and medical scientists specifically for self test use at home. Due to medical regulations we are only allowed to supply two test strips per pack direct to the public. However, there are no restrictions on the number of packs that you can order. If you have ongoing problems with urine infections and need to test frequently we recommend that you speak with your doctor. IMPORTANT: We are aware that some online companies are selling urine test strips to the public which are intended for professional use only. You can check whether your urine test strips are genuinely for use at home by looking for the CE mark and a number, if there is no number next to the CE mark then the urine test strips are for professional use only and you should contact your local Trading Standards.